NSA aside, Apple makes it difficult for users to extract and download text messages from their iPhones onto a computer. For whatever reason (legal, devious, neurotic, etc), we've all found a time where we'd like to save backups of certain meaningful, important, or perhaps incriminating conversations (including all MMS or iMessage pictures and videos). While there are a handful of third-party applications that can help with this process, the majority of them cost money and implement certain techniques that could be shady (ex: requiring you to upload a full iOS backup to a website). 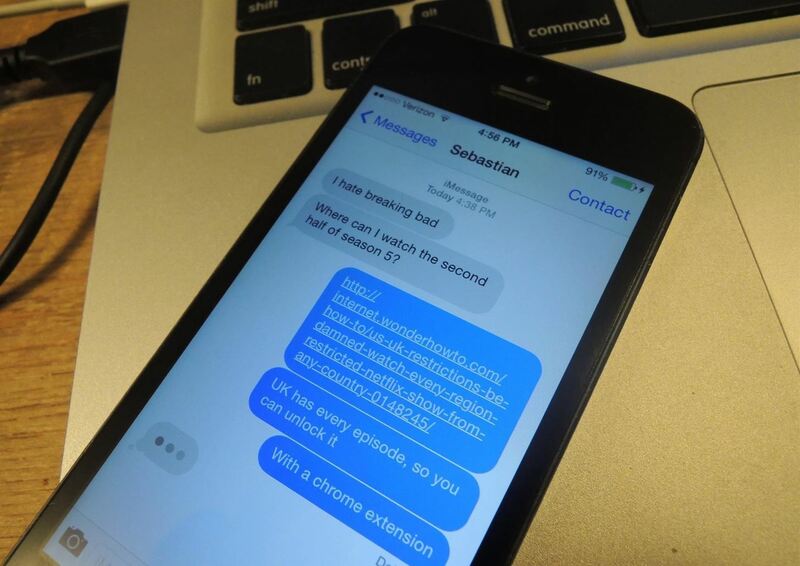 Now, thanks to chelseybaker, you can easily extract all of the text messages on your iPhone and keep them on your desktop using his open-source Perl script. If the thought of working with an open source script sounds scary to you, don't worry. I'm no coder and it's pretty easy. Even if you've never seen a line of code in your life, I'll hold your hand through all the steps. UPDATE: Step 5 has been updated, since many of you were having trouble with the PERL script not running successfully. Thanks to Newell Jones for the tip! Using iTunes, back up the iPhone with the conversation(s) you want to download. Just Right-Click on your iPhone in iTunes and click Back Up. Right-Click and arrange all of the folders by Date Modified. The most recent one will be your latest iPhone backup. 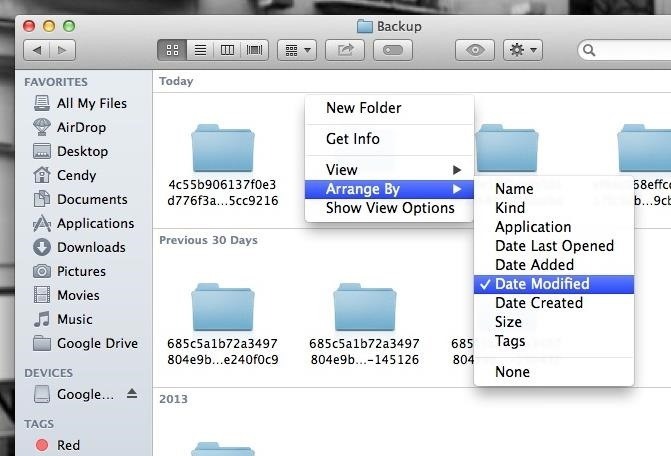 Create a folder on your desktop and name it iOSBackup. This is where we're going to save everything to make running the script easy. 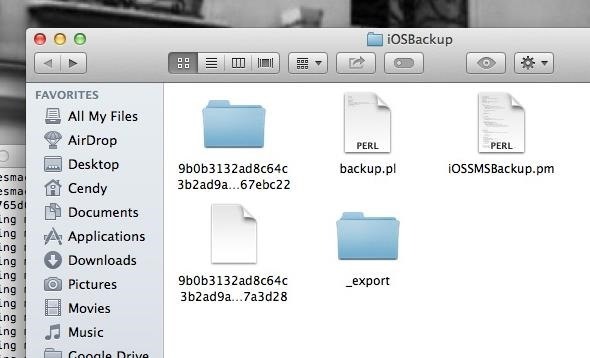 Copy the backup folder you found from step 2 into your new iOSBackup folder on your Desktop. This lets us work on it without conflicting with iTunes. UPDATE: This step has been updated. 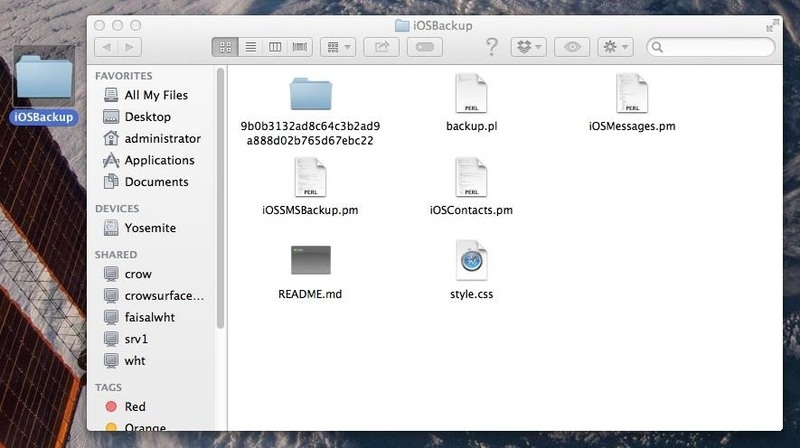 Copy all six files into your iOSBackup folder you created on the desktop during Step 3. Now you'll need to open up Terminal (which you can find by hitting Command+Spacebar and typing "Terminal"). 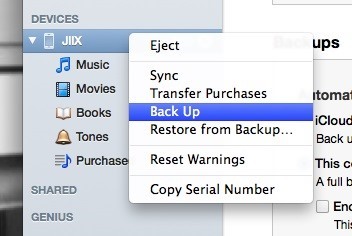 After pressing enter, head back to your iOSBackup folder. In the iOSBackup folder you created, you will now see an _export folder. Open it and you'll find folders for all the conversations you've had, each one consisting of HTML files that make up the text messages and images. You'll find multiple HTML files in each folder, as the text messages are grouped by days. Next to certain HTML files you'll see corresponding folders containing any pictures you were sent with that text message. If you click the HTML file your web browser will open up, showing your text message conversation with pictures included. Note that Emoji will only show up if you open the html files in Safari. And there you have it. All your raw text message data. Backed up and organized. You can now use spotlight to search them, or make copies of any of the images or videos. If you'd like, you can print-to-PDF to convert them to an easier-to-share format. I was searching how to save iPhone text messages to PC and landed here. But unfortunately this tutorial is for Mac users. The app demonstrated in this YouTube video works and save iPhone text messages but it comes with some trial limitations. Can anybody here can help me to save iPhone messages to my windows PC for free? Thanks! This tutorial is for Mac users so I will follow the instructions posted by you coz I'm on Windows 10 PC. Update: I followed above instructions but it didn't work on my Windows PC but I did some further Googling and found this guide http://www.easyphonerecovery.com/how-to-backup-save-iphone-text-messages-to-pc-or-mac.html . Finally, I could transfer all the text messages and imessages including attachments to my computer. I didn't try but as per the website description it will work on a Mac too. Can't locate DateTime.pm in @INC (@INC contains: /Library/Perl/5.12/darwin-thread-multi-2level /Library/Perl/5.12 /Network/Library/Perl/5.12/darwin-thread-multi-2level /Network/Library/Perl/5.12 /Library/Perl/Updates/5.12.3 /System/Library/Perl/5.12/darwin-thread-multi-2level /System/Library/Perl/5.12 /System/Library/Perl/Extras/5.12/darwin-thread-multi-2level /System/Library/Perl/Extras/5.12 .) at iOSSMSBackup.pm line 8. BEGIN failed--compilation aborted at iOSSMSBackup.pm line 8. Compilation failed in require at backup.pl line 7. BEGIN failed--compilation aborted at backup.pl line 7. Yeah, I'm getting the same exact error. Bummer. v-string in use/require non-portable at backup.pl line 3. Can't locate DateTime.pm in @INC (@INC contains: /Library/Perl/Updates/5.10.0 /System/Library/Perl/5.10.0/darwin-thread-multi-2level /System/Library/Perl/5.10.0 /Library/Perl/5.10.0/darwin-thread-multi-2level /Library/Perl/5.10.0 /Network/Library/Perl/5.10.0/darwin-thread-multi-2level /Network/Library/Perl/5.10.0 /Network/Library/Perl /System/Library/Perl/Extras/5.10.0/darwin-thread-multi-2level /System/Library/Perl/Extras/5.10.0 .) at iOSSMSBackup.pm line 8. DBD::SQLite::db prepare failed: file is encrypted or is not a database at iOSSMSBackup.pm line 68. ...never mind the last post...I figured it out. I had the "encrypted" option checked during the first backup. Make sure that is turned off. What does that mean where is the "encrypted" option? Help please? I am code illiterate. Just trying to save an important text conversation and this was the easiest method I found. I also tried cpan DateTime to see if it would work. Can't locate iOSMessages.pm in @INC (@INC contains: /Library/Perl/5.12/darwin-thread-multi-2level /Library/Perl/5.12 /Network/Library/Perl/5.12/darwin-thread-multi-2level /Network/Library/Perl/5.12 /Library/Perl/Updates/5.12.3/darwin-thread-multi-2level /Library/Perl/Updates/5.12.3 /System/Library/Perl/5.12/darwin-thread-multi-2level /System/Library/Perl/5.12 /System/Library/Perl/Extras/5.12/darwin-thread-multi-2level /System/Library/Perl/Extras/5.12 .) at iOSSMSBackup.pm line 7. BEGIN failed--compilation aborted at iOSSMSBackup.pm line 7. Can't locate iOSMessages.pm in @INC (@INC contains: /Library/Perl/5.16/darwin-thread-multi-2level /Library/Perl/5.16 /Network/Library/Perl/5.16/darwin-thread-multi-2level /Network/Library/Perl/5.16 /Library/Perl/Updates/5.16.2 /System/Library/Perl/5.16/darwin-thread-multi-2level /System/Library/Perl/5.16 /System/Library/Perl/Extras/5.16/darwin-thread-multi-2level /System/Library/Perl/Extras/5.16 .) at iOSSMSBackup.pm line 7. How can I view them on a PC?? I don't have 'terminal' and the locations aren't the same on a PC... Help?? Can't locate DBI.pm in @INC (@INC contains: /opt/local/lib/perl5/siteperl/5.12.4/darwin-thread-multi-2level /opt/local/lib/perl5/siteperl/5.12.4 /opt/local/lib/perl5/vendorperl/5.12.4/darwin-thread-multi-2level /opt/local/lib/perl5/vendorperl/5.12.4 /opt/local/lib/perl5/5.12.4/darwin-thread-multi-2level /opt/local/lib/perl5/5.12.4 /opt/local/lib/perl5/siteperl /opt/local/lib/perl5/vendorperl .) at iOSSMSBackup.pm line 3. BEGIN failed--compilation aborted at iOSSMSBackup.pm line 3. What exactly is the DBI.pm? Should I install something else? Any help would be much appreciated. Thank you. I had the same troubles outlined throughout the thread. The two main hangups seem to be 1.) not going through the full perl install, and 2.) not copying all the Github filz into your iOSBackup folder the tutorial says to pluck 2 of them out, but putting all of them from the Github download allowed the process to go through. Awesome Export! Thanks for your tip, everything works well now. Credited you in the article! Article has been updated (Step 5 specifically) and it works perfect now! I really need this to work and I too had the problem with DateTime. I typed DateTime into the Terminal text line and was asked many questions to which I didn't know the answer. I think if you could help me get past the DateTime error, it would work. Can you help? DBD::SQLite::db prepare failed: no such table: handle at iOSMessages.pm line 85. I am getting the same. Export works fine with my current backups running iOS version 6.1.3, but not working for older versions (probably version 5). Can't locate iOSMessages.pm in @INC (@INC contains: iOSMessageExport/ /Library/Perl/5.16/darwin-thread-multi-2level /Library/Perl/5.16 /Network/Library/Perl/5.16/darwin-thread-multi-2level /Network/Library/Perl/5.16 /Library/Perl/Updates/5.16.2 /System/Library/Perl/5.16/darwin-thread-multi-2level /System/Library/Perl/5.16 /System/Library/Perl/Extras/5.16/darwin-thread-multi-2level /System/Library/Perl/Extras/5.16 .) at iOSSMSBackup.pm line 7. DBD::SQLite::db prepare failed: no such table: message at iOSMessages.pm line 86. Can't locate DateTime.pm in @INC (@INC contains: /Library/Perl/Updates/5.10.0 /System/Library/Perl/5.10.0/darwin-thread-multi-2level /System/Library/Perl/5.10.0 /Library/Perl/5.10.0/darwin-thread-multi-2level /Library/Perl/5.10.0 /Network/Library/Perl/5.10.0/darwin-thread-multi-2level /Network/Library/Perl/5.10.0 /Network/Library/Perl /System/Library/Perl/Extras/5.10.0/darwin-thread-multi-2level /System/Library/Perl/Extras/5.10.0 .) at iOSSMSBackup.pm line 5. BEGIN failed--compilation aborted at iOSSMSBackup.pm line 5. Even tried the Cpan datetime solution! What OS X are you running? Or what other information can you provide that might help us troubleshoot this. With the updated Step 5, I was able to pull the texts without the Cpan datetime solution. You can combine all the conversations for one person into one file by using command cat .html >output.html ! That is exactly what I would love to do! How exactly can I do that? I have several text folders, though I would only like to do that to one. Can you be more specific? ie: provide actual path for that command? I think I see what you mean. You are actually saying to edit the "PEARL" script to reflect this action. Sorry, but thanks! Hi Hannah! Can you please clarify how to combine all conversations for each number into one file per number? Are you still active on this page because I am having problems and haven't seen anyone active with responses in months! We use the decipher text message software at our small law firm since we are required to save (and print out) sms chats with our clients. Meanwhile, I never knew "option key" + go menu would make that hidden library show up! Hi Marina, does it support a Windows PC and is it free of cost? make test had returned bad status, won't install without force. I am desperate for this to work, and I am not super techie, but I know I can do it if I don't hit errors all the time.. HELP ME PLEASE! Great script!! This works great on PC as well. I was using Windows 8.1. You'll have to install Perl first so that Windows can run Perl scripts. I choose Strawberry Perl and downloaded and installed it with no effort or issues and rebooted just to make sure environment path variables and such were updated. After that, you can follow the steps above just as they are, with slight variations on Step 2 and Step 6. Note2: C:\Users is the directory on Windows 8 where it stores user information. This folder is different on other versions of Windows. On a windows PC you'll use the Command window instead of Terminal. You can get to this in various ways on different versions of windows, but the easiest way is to hold the shift button down while right clicking on the iOSBackup folder you created on the desktop. Then release the shift button and choose "Open Command Window Here" from the context menu that pops up. Once the command window opens, continue with the Step 6 instructions above where it instructs you to type in "perl backup.pl --directory <folder>/"
I didn't run into the DateTime Module issue when using Strawberry Perl, but the zip downloaded as part of this article, includes a README.md file that you can open with NotePad for additional help and suggestions from the author. Hi, Trying your fix, but I must be missing something. The latest message I am getting is Directory does not exist at iOSSMSBackup.pm line 23. Any guidance you can offer? Thomas, have you found a solution? I'm having the same problem. Is there any way to modify the style.css? The colors are a bit hard to read. Or -- what's the best way to export as a .pdf? Thanks so much! This worked like a charm. This worked brilliantly. Thanks so much. Hi - simple question. Can this be used to transfer the messages back into an iPhone? I'm also having the whole "BEGIN failed--compilation aborted at backup.pl line 7" problem. I'm running iOS 10.6.8. I ran the cpan DateTime as well, with no help. Any solutions? Really smooth process!!! Really great!!!! Thanks! Mine worked great too. I ended up copying and pasting each of the commands instead of typing it. I wasn't doing something right to begin with, but once I stopped trying to type it myself, problem was solved. I think on the word "perl", it's not an "l", it s a symbol. At least that is how it appeared on my screen. Jane, I was getting that too. Leave off the <> around the folder name. I also get the error message "Directory does not exist at iOSSMSBackup.pm line 23". It took me several tried on both codes to discover not to include the • in the first code and where there should be spaces. It would be good if you could make that more clear. Thanks. When I copied the Backup folder as instructed, Mac added a space and the word copy. I have both included that and not included that when replacing <folder> with the long string of letters and numbers that constitute the folder name. I have included the forward slash at the end. Any suggestions for what I might be doing wrong? I keep getting same error message like others above. Has anyone figured out a solution yet?? I have MacBook Pro Version 10.6.8 Thank you!!! Got this error message. Anybody know how to fix it. Script ran fine and I got a lot of messages exported just as indicated. Many Thanks!! 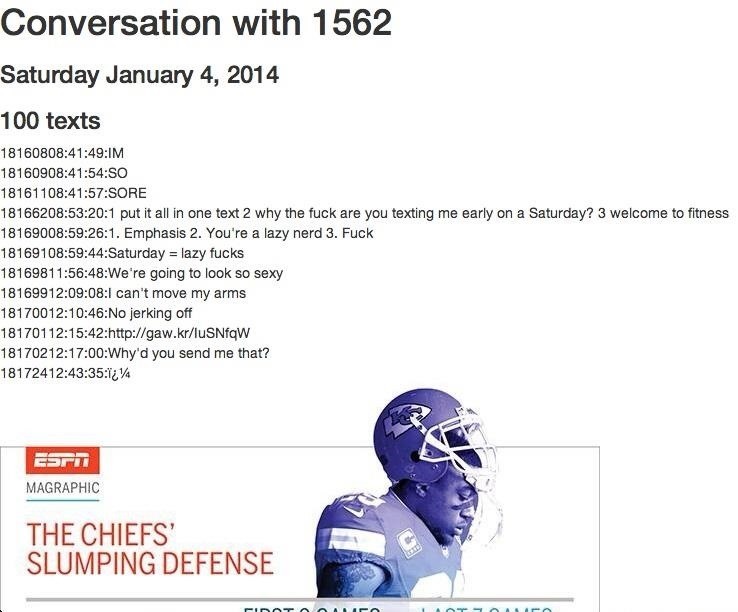 However, for one phone number, the most recent texts were not exported. The export stopped at 4/3/2014. Other numbers did export the most recent texts. Does anyone have any ideas as to why this happened and what Can do about it? I am getting "no such table" error for iOS version 7.1. Can you please help get this script running. THANK YOU! I was looking/searching/asking for a simple way to get this accomplished and this worked perfectly! I would appreciate help on this as I need to save my photos and videos from iMessage. Wow... after looking and downloading 3 different 'free' programs to to this (only to be told I have to pay to actually export a txt file), this was a pinch! Great step by steps instructions! oh .. and one more thing .. the purple background for received messages (and the grey background for sent message) was just too much of an eye-sore .. beside making received messages hard to read .. so, I went into the style sheet to change it. All you have to do is open the file 'style.css' in your export folder (in a plain-text editor) and change the word purple to a different hex color (I chose #FC6). And, since I was already at it, I changed the old-school grey background to white. Then save the file and that's it. Easier to read and better for print. I'm still getting "Can't locate DBI.pm in @INC...". All 6 files are in the iOSBackup folder; I believed perl is installed. Mac runs OS X 10.10.2. Anyone could shed some light on the mystery? Can't locate DateTime.pm in @INC (@INC contains: /Library/Perl/Updates/5.10.0/darwin-thread-multi-2level /Library/Perl/Updates/5.10.0 /System/Library/Perl/5.10.0/darwin-thread-multi-2level /System/Library/Perl/5.10.0 /Library/Perl/5.10.0/darwin-thread-multi-2level /Library/Perl/5.10.0 /Network/Library/Perl/5.10.0/darwin-thread-multi-2level /Network/Library/Perl/5.10.0 /Network/Library/Perl /System/Library/Perl/Extras/5.10.0/darwin-thread-multi-2level /System/Library/Perl/Extras/5.10.0 .) at iOSSMSBackup.pm line 5. I have tried this several times and I keep getting this error. I even backed it up again after turning off the encryption. DBD::SQLite::db prepare failed: file is encrypted or is not a database at iOSMessages.pm line 86. Finally after several attempts...Praise God...It worked...I don't know what I did differently but now it works. Thank you so much for this blog! now what do i do? I'm using a laptop pc with windows 8.
but running export PERLLIB=iOSMessageExport/ did not produce any errors. Should the statement literally have the text "--directorypath" in it? I am using "/Desktop/IOSBackup" in its place. Directory does not exist at iOSSMSBackup.pm line 23. Update: I got the script to run. I finally realized I have more than one user on the computer so I had to get to the iOSBackup folder by specifying the user. Now, I'm getting a similar error to others before me. DBD::SQLite::db prepare failed: no such table: handle at iOSMessages.pm line 86. Did anyone figure this "no such table" error out? I joined this site just to say HOW INCREDIBLE THIS WORKED!!!! I am so grateful to have figured this out finally. I have been all over the internet and everybody wants money!! Sure you can download the demo, but that doesn't get you anything. The first pass with this I had an error and that was because I had an encrypted backup. Re-did the backup and it worked like a charm. Thanks so much for all the effort put into getting this on the best website and finding it's way to my search query! add the *slash* at the end of the 2nd command in terminal. And please, if you come across this sort of problem, and then get it fixed, tell the rest of the world. You did get this fix for free, and you'd have prob paid money for it. Admittedly, I have rightly been called an "illiterate end-user" but i can't seem to make this system work! I get so far and then - BOOM, the desired result doesn't happen. For instance, early in the process - you say to go to the Finder GO and access Library. There is NO Library on my drop-down menu. Now what do I do? 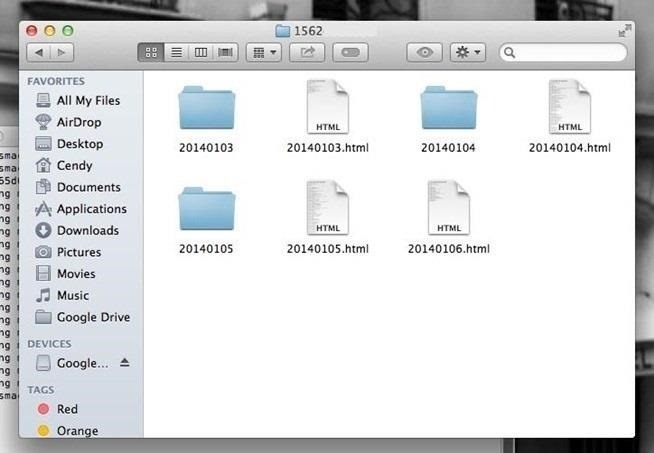 Apple has hidden the "Library" folder in recent operating system versions. When you select "Go" in Finder hold the option key down and the Library folder will appear with the rest. Once you select it you can treat it like any other folder. In case anyone lands here looking to run this script and find it not working, here's what I've found. At some point in the last year or two, it looks like Apple started placing files into subfolders beginning with the first 2 characters of the GUIDs. So, for example, the "3d0d7e5fb2ce288813306e4d4636395e047a3d28" file that the script looks for is now in "3d/3d0d7e5fb2ce288813306e4d4636395e047a3d28". The script ends up not finding it and failing. 1) Learn perl and go through and update the script to learn how to navigate the structure. 2) Move all of the files from the subfolders into a single giant folder. The easiest way to do #2 is to do a search on your iTunes backup folder for ALL files. This should bring up all of the files in all of the subfolders. For me, this was 25k files. Select ALL of these files and move them into a single folder. Once that's done, you can run this script against the new 1-folder-containing-all-files folder. For those struggling to extract your files from a Windows 10 machine and receiving the "no such table" error - and don't wish to learn perl as Som SanDiego suggests above - the solution can be found on github under the comments of this file. Here's all you need to do. Download and install NotePad++ if you don't already have it. This program will display line numbers so you don't have to count. Be sure to save and close the file. Save all files, and run the script as the directions indicate. It should work (as of 3/24/2017). Not sure what the issue is however any help is very welcome. Follow the instructions in this guide. I have found, however, that while it extracts all the SMS conversation history to HTML files fine, all subdirectories are empty and no attachments get extracted. If anyone has a fix drop a hint! It has an updated set of files. When I replaced the ones I had retrieved in Step 5 linked above with the ones in the link I've added here, this process worked like a charm! So, I think step 5 needs to be updated one more time, if the original author is still around to do that! Can anyone tell me why my backup only contains messages from 2016 but photos go all the way back to 2014?